Those who are serious about their Turkey Hunting often refer to this magnificent creature as the Thunder Chicken. In this wildlife scene by artist Ryan Beeson you can practically hear the sound of of the great gobblers thunder as lightning strikes. 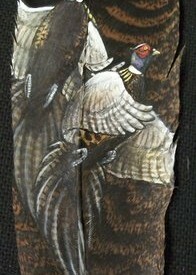 This larger work of art is captured on 2 Turkey Fan Feathers, molded together to expand the size of the scene. 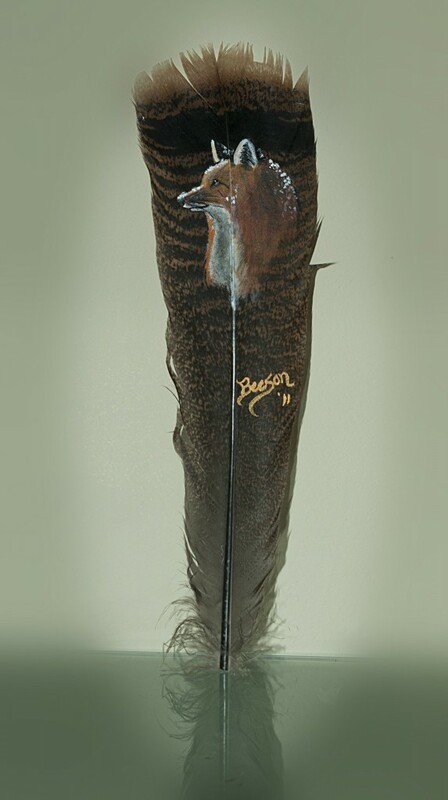 2 Turkey Fan Feathers – This is an Original Work of Wildlife Art from Beeson Outdoor Adventures. 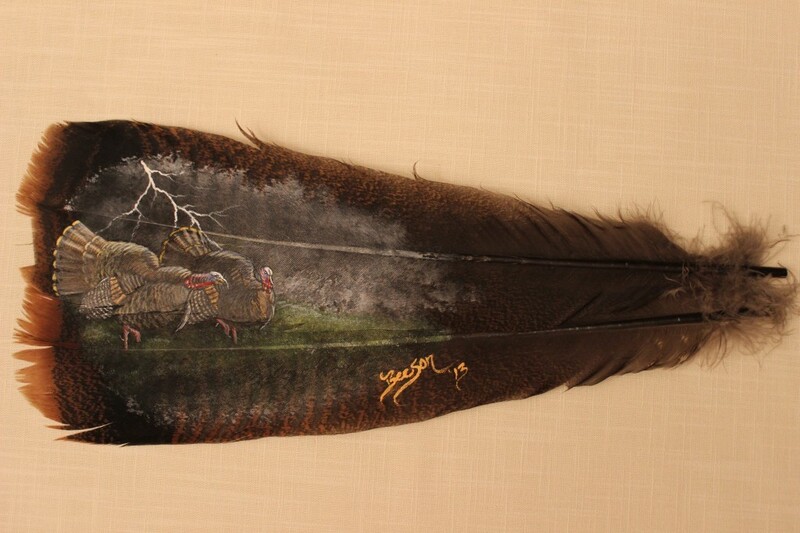 • Authentic Wild Turkey Feather • Original Work of Art – No Two Feathers or Scenes are Identical • Hand Painted in Amazing Detail • Signed by Artist Ryan Beeson • UNFRAMED (see product listings for framed options) SHIPPING: Please allow 2-3 Weeks from Date of Purchase. This Painted Turkey Feather is an Original Work of Art. Packaged in a protective sleeve, on cardboard, all in a standard box. Ships USPS with Tracking Number SIZE: 2 Turkey Fan Feathers ALL TURKEY FEATHERS VARY IN SIZE TO SOME DEGREE All products are subject to slight variations because they are all ORIGINAL WORKS OF ART. Deer Hunting on a cold winter morning, the minutes in a tree stand can seem like hours and your mind may drift to the warmth of your fireplace and your favorite chair. Then the snow slowly begins to fall and your senses tingle on high alert for reasons you can’t explain. Then you see him and the adrenaline heat rushes in to replace the cold. In this beautiful Painted Turkey Feather, Ryan Beeson captures the snow covered morning when you spot the bruiser buck chewing on a young sappling. Closer…..closer…. 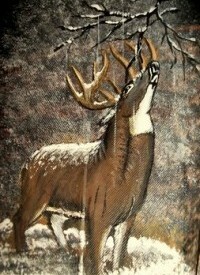 This is an Original Work of Wildlife Art. 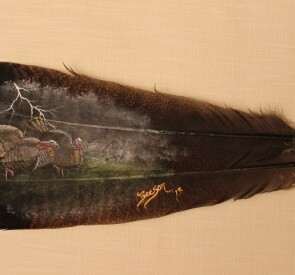 • Authentic Wild Turkey Feather • Original Work of Art – No Two Feathers or Scenes are Identical • Hand Painted in Amazing Detail • Signed by Artist Ryan Beeson • UNFRAMED (see product listings for framed options) SHIPPING: Please allow 3-4 Weeks from Date of Purchase. Packaged in a protective sleeve, on cardboard, all in a standard box. Ships USPS with Tracking Number. Free Shipping. 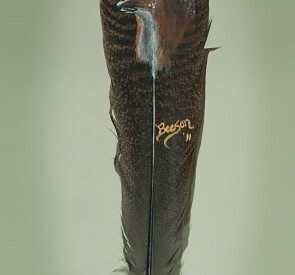 SIZE: Approximately 11″ Long x 3″ Wide is the entire Turkey Feather ALL TURKEY FEATHERS VARY IN SIZE TO SOME DEGREE. COLOR: As seen in the pictures shown here. Turkey feathers are primarily from the birds tail/fan. All products are subject to slight variations because they are all ORIGINAL WORKS OF ART. 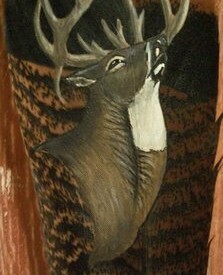 There are just some deer that render a hunter and outdoorsman speechless. The bucks strength, posture, elegance, attitude….and of course rack all come together to create an animal to be respected….and pursued. 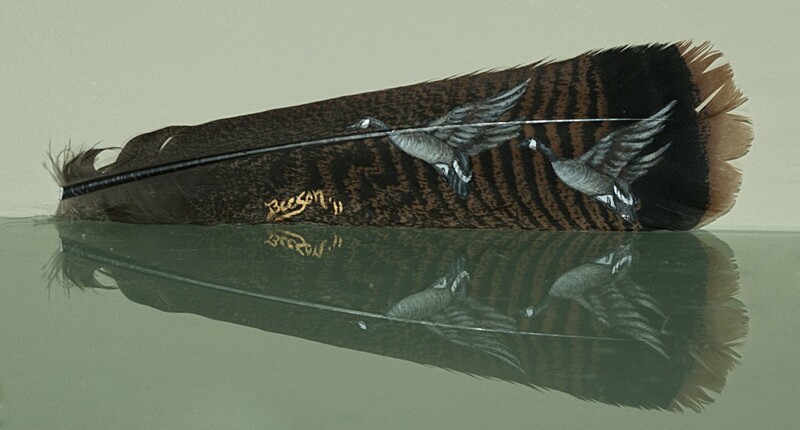 In this piece of wildlife artwork, Ryan Beeson captures these elements on a wild turkey feather that you will want to display with your proudest trophies and memories. A symbol of Freedom that cannot be denied, the Bald Eagle is the most patriotic bird of flight in all of America. 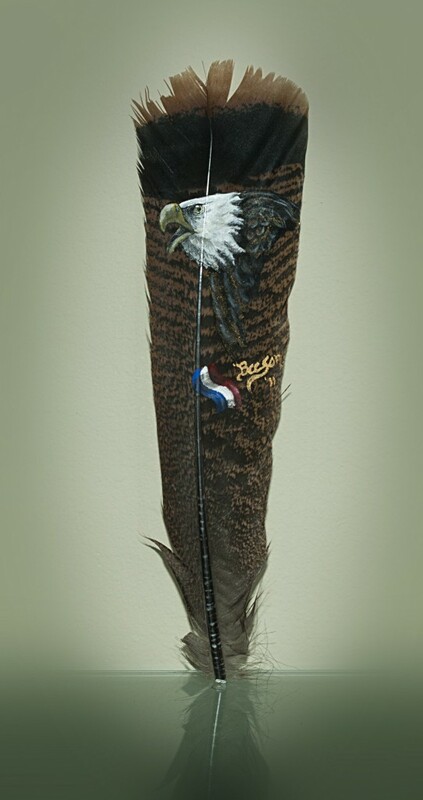 Here, artist Ryan Beeson captures the Symbol of Freedom and Power on his favorite canvas – the wild turkey feather. Made in the USA by a True Outdoorsman! Rarely seen in the wild because of its nocturnal characteristics, the elusive Red Fox is both an agressive predator and a creature of beauty. Here, artist Ryan Beeson, of Beeson Outdoor Adventures, captures the snow dusted Little Fox in a simple and spectacular pose. 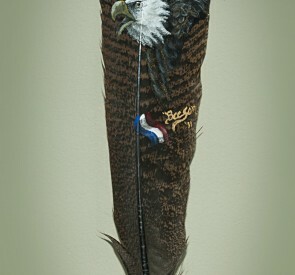 • Authentic Wild Turkey Feather • Original Work of Art – No Two Feathers or Scenes are Identical • Hand Painted in Amazing Detail • Signed by Artist Ryan Beeson • UNFRAMED (see product listings for framed options) • Very Limited Quantity – Act Fast SHIPPING: Please allow 2-3 Weeks from Date of Purchase. This Painted Turkey Feather is an Original Work of Art. Packaged in a protective sleeve, on cardboard, all in a standard box. Ships USPS with Tracking Number SIZE: Approximately 11″ Long x 3″ Wide is the entire Turkey Feather ALL TURKEY FEATHERS VARY IN SIZE TO SOME DEGREE WEIGHT: Light as a Feather! COLOR: As seen in the pictures shown here. Turkey feathers are primarily from the birds tail/fan. All products are subject to slight variations because they are all ORIGINAL WORKS OF ART. Click “More Details’ Below and the Picture Shown Here for More Images. 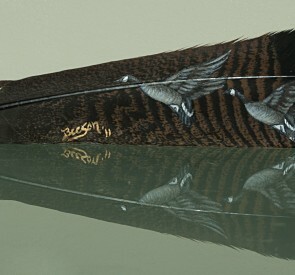 • Authentic Wild Turkey Feather • Original Work of Art – No Two Feathers or Scenes are Identical • Hand Painted in Amazing Detail • Signed by Artist Ryan Beeson • UNFRAMED (see product listings for framed options) • Very Limited Quantity – Act Fast SHIPPING: Please allow 3-4 Weeks from Date of Purchase. This Painted Turkey Feather is an Original Work of Art. Packaged in a protective sleeve, on cardboard, all in a standard box. Ships USPS with Tracking Number. Free Shipping. SIZE: Approximately 11″ Long x 3″ Wide is the entire Turkey Feather ALL TURKEY FEATHERS VARY IN SIZE TO SOME DEGREE WEIGHT: Light as a Feather! COLOR: As seen in the pictures shown here. Turkey feathers are primarily from the birds tail/fan. All products are subject to slight variations because they are all ORIGINAL WORKS OF ART.